On February 16, 2015, the Ministry of Corporate Affairs (MCA) released a roadmap for the next phase of implementation, to be active from April 1, 2016. The map is intended to bring both domestic and foreign companies with a minimum net worth of Rs 500 crore into full compliance with Ind-AS and, therefore, into effective compliance with IFRS. This will be extended to companies with a net worth of Rs 250 crore by April 1, 2017. Ind-AS-based comparative figures for the previous year will also be required. 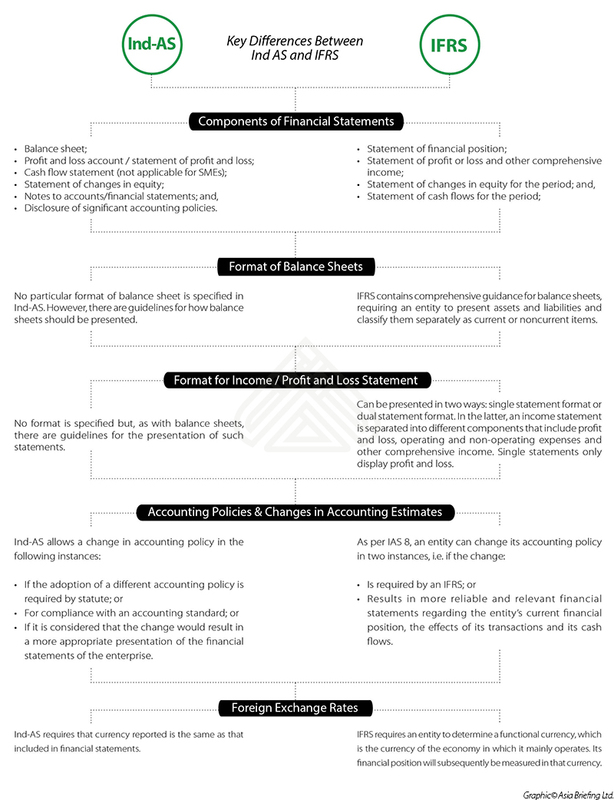 Even with this latest implementation phase, there are still some notable differences between Ind-AS and IFRS, as can be seen in our graphic to the below. While the ICAI may eventually attempt to fully incorporate IFRS into Ind-AS, this will likely not occur for a number of years. It is therefore important for foreign firms operating in India to fully understand the differences in accounting standards that still exist. Overall, however, the accounting changes introduced by Ind-AS are positive for foreign firms operating in India. Implementation of the new principals will align a company’s reporting more closely with best practices in their home country, allowing for enhanced transparency that will help investors and stakeholders better understand a business’s financial situation. With mandatory compliance fast approaching, there is a limited amount of time for companies operating in India to prepare for Ind-AS implementation. Businesses should firstly develop an outline of how the new standards will replace existing ones, and then look to embed Ind-AS into their operational systems, train their financial teams, and ensure all company managers understand the new accounting principles. 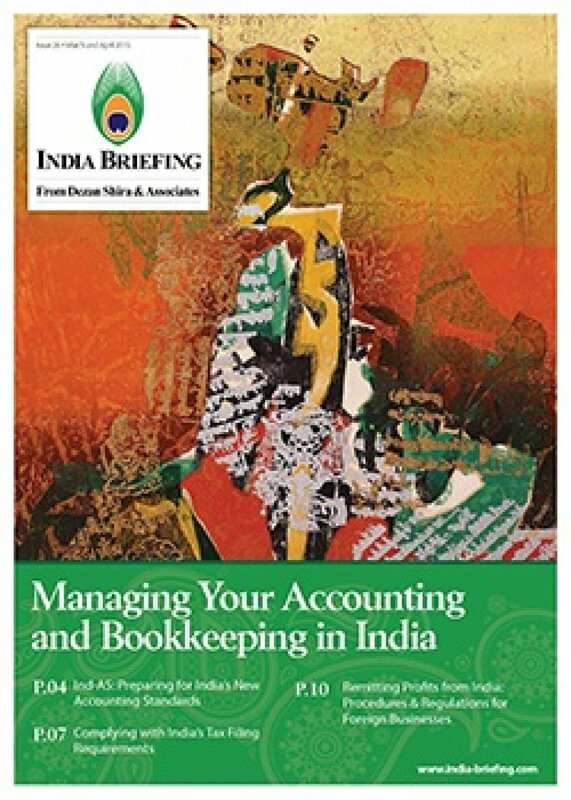 This article is an excerpt from the April issue of Indian Briefing, titled “Managing Your Accounting and Bookkeeping in India“, in which we spotlight three issues that financial management teams for India should monitor.In the first article, we examine the new Indian Accounting Standards (Ind AS) system, which is expected to be a boon for foreign companies in India. We then highlight common filing dates for most companies with operations in India, specifically filings related to income tax, the Reserve Bank of India (RBI), and the Ministry of Corporate Affairs (MCA). In this issue of India Briefing Magazine, we outline the fundamentals of India’s import policies and procedures, as well as provide an introduction to the essentials of engaging in direct and indirect export, acquiring an Indian company, selling to the government and establishing a local presence in the form of a liaison office, branch office, or wholly owned subsidiary. We conclude by taking a closer look at the strategic potential of joint ventures.